Walking along Booth Street on the way to dinner, the light hit the surrounding buildings at exactly the right time in exactly the right way. Golden Hour isn’t a common sight in Northern England, but all week the weather gods had been kind and merciful as I experienced this beautiful part of the country for the first time. As we walked to a new wave Catalonian restaurant, as you do, I thought not for the first time how very different the Manchester of reality was from my own stereotypes and preconceptions. Thinking back on it, I’m fairly certain that my ideas about Manchester were based on a mash up of Dickens novels and nothing based in reality or even common sense. I’m willing to bet that I’m not alone either. One of the first comments from friends upon my return hone was, “But isn’t that a dirty industrial city?” Since I’m not the only one whose ideas about Manchester are fixed firmly in the 1880s, I thought today I would share what I discovered during my few days exploring the city and why I think it’s a critical component of any Northern England travel itinerary. This post was written as the result of a press trip with VisitBritain, but of course all thoughts and opinions are entirely my own. Although Manchester’s roots date back to Roman times, most of us know it for its importance during the Industrial Revolution. Thanks to a boom in the textile industry, Manchester became the world’s first industrialized city, to be followed by many other advances in fairly quick order. In the 1850s, the city established its own ship canal, bypassing Liverpool and linking it directly to the Irish Sea, thereby once again increasing its fortunes. This is the city where the atom was first split, where the world’s first passenger railway was opened and where the modern computer was invented. I share these bits of trivia because, as it turns out, they’re important aspects of any visit to Manchester, even today. The ghosts of the past are everywhere, but so is the work ethic and creativity that catapulted the city to business and industrial fame in the first place. The city’s cherished symbol is the worker bee for a reason; this is a city that doesn’t mind rolling up its sleeves to get a job done that needs getting done. Today it means something different than in the 19th century, but it’s still important and is reshaping the city into something new and different once again. By now, the global trend of cities redeveloping their downtown centers and encouraging creative chefs to set up shop isn’t news. It’s just that, a global trend, but I was especially happy to discover it underway with flair in Manchester. The reasons for what really is a global shift are many, but it’s a combination of adventurous young entrepreneurs and a dining public open to learning about new food and drink. It’s not a phenomenon that could have taken place twenty years ago, but in the 21st century the timing was just right for a massive shift in how most of us approach food. 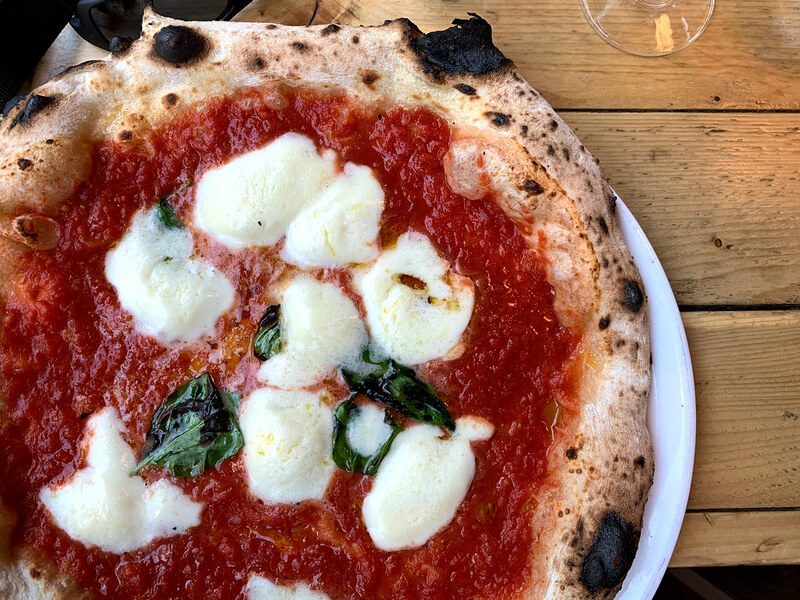 In Manchester, there are just too many examples of fun and delicious restaurants and cafes to list them all, but a couple impressed me deeply and I think are worth mentioning. Created by MasterChef UK winner Simon Wood, WOOD Manchester is an unusual approach to fine dining. I personally usually shy away from fine dining experiences, but as soon as I walked in through the front doors I knew this was something different. Everything about WOOD is approachable, from the staff and decor to its dynamic menu. Even better, I loved everything I tried, a true rarity for a picky eater like myself. Simon could have opened his restaurant anywhere in the UK, but chose his hometown for a reason and it’s that passion for the community that impressed me more than anything else. For something completely different, don’t miss the somewhat new restaurant Tast. The passion project of Michelin starred chef Paco Perez, it’s a fun and quirky approach to Catalonian cuisine. 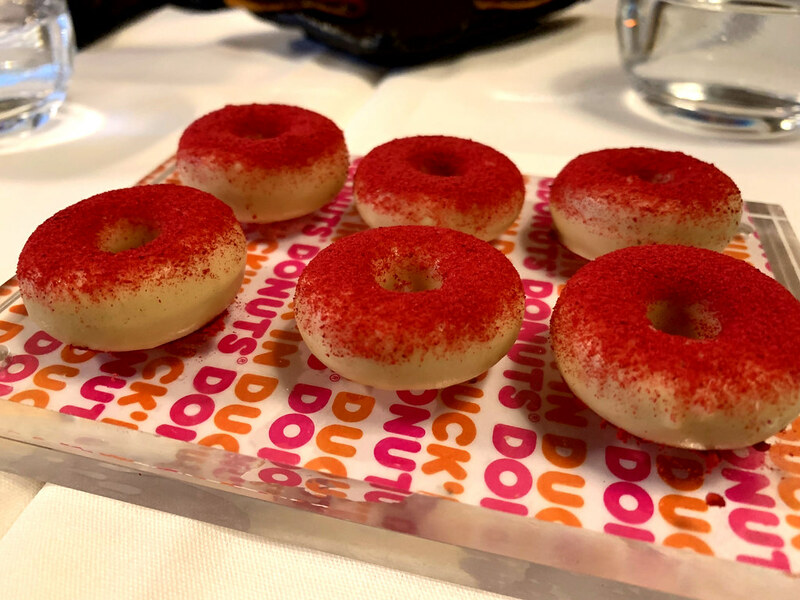 Since the food in and around Barcelona and Girona is amongst my most favorite, I was excited for the experience and I wasn’t disappointed. It’s not your grandma’s cooking though, Chef Perez shows off his creativity here with dishes like a duck liver and chocolate garnished Duckin’ Donut and a Wagyu steak banh mi that you’ll never forget. I think it’s the more casual establishments around Manchester though that are the real stars. There are plenty of spots to grab a coffee, pint or bite quickly but without sacrificing taste or even style. The best example of this is I think the Mackie Mayor. 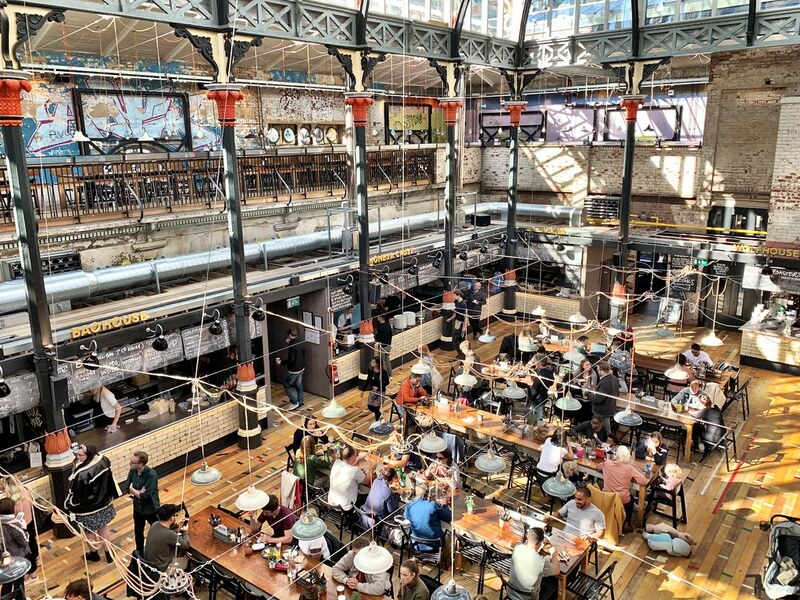 A reclaimed Victorian market hall, this is the exact sort of establishment that the shift in food tastes has created. Inside you’ll find a variety of stalls, permanent food trucks of a sort, offering a little bit of everything, again with a fierce creativity and sense of style. It also doesn’t hurt that the space itself is gorgeous; light and airy but preserving the architectural bones from the 19th century. 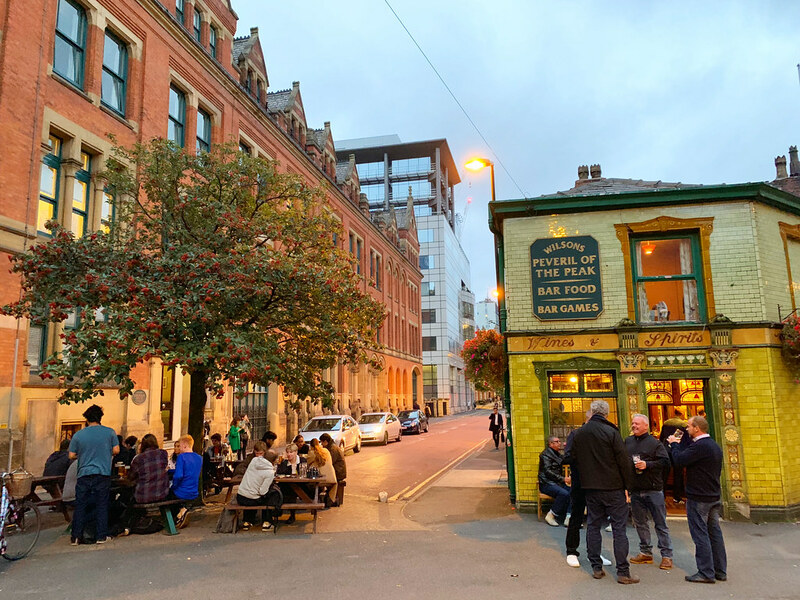 An entire trip could be put together highlighting the culinary chops of Manchester, but even if you’re not a foodie it’s a fun and important aspect of any visit to the city. Anyone can Google “What to do in…” and come up with a short list of any city’s top tourist sights. So I’m not going to do that for you today. No, instead I want to share a few moments around Manchester that helped the city define itself for me; that made an impression, starting with the Victoria Baths. Built in the early 20th century, although the baths themselves are no longer in use thankfully the gorgeous building that once housed them still is. Created in an era when craftsmanship mattered, no detail is left unattended creating the marvel that we see today. Another architectural beauty that’s not to be missed is John Ryland’s Library. Inside it looks more like a scene from Harry Potter than an actual place anyone can visit, but that’s all part of the magic behind this neo-Gothic masterpiece. Whether it was getting up early to watch the sunrise over the Salford Quays, or a simple walk to the train station, architecture, design and urban beauty were at the heart of my experience in Manchester, perhaps best experienced on two very different tours of the city. 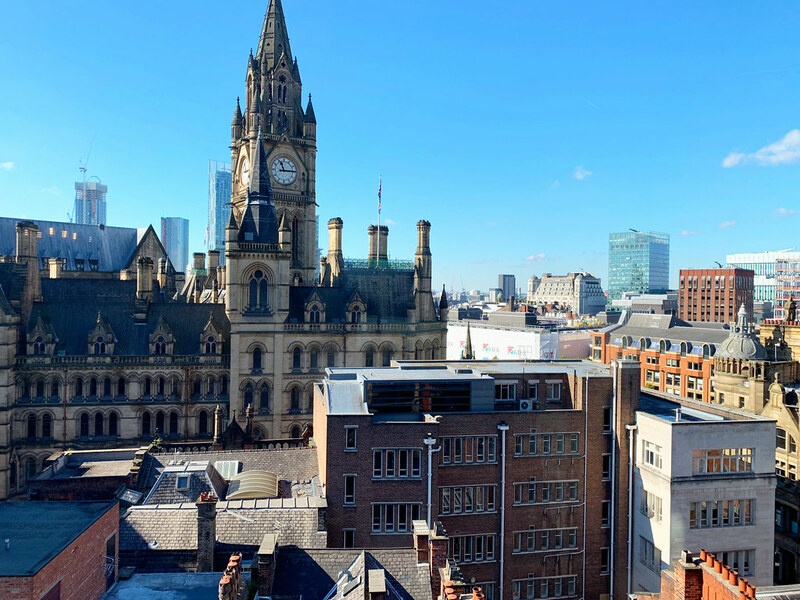 Former taxi driver turned tour guide, in just a few short years John Consterdine has established the Manchester Taxi Tours as one of the must-do activities in the city. John takes guests around town in a traditional black cab, sharing highlights of the city, but also heavily tailoring it to the individual. Whether it’s spending a few hours learning about the city’s incredible musical history (The Smiths, Oasis, The Stone Roses, etc.) or visiting some of the most scenic spots, there’s no better way to learn about the city and, from my own experience, no one better than John to share them. 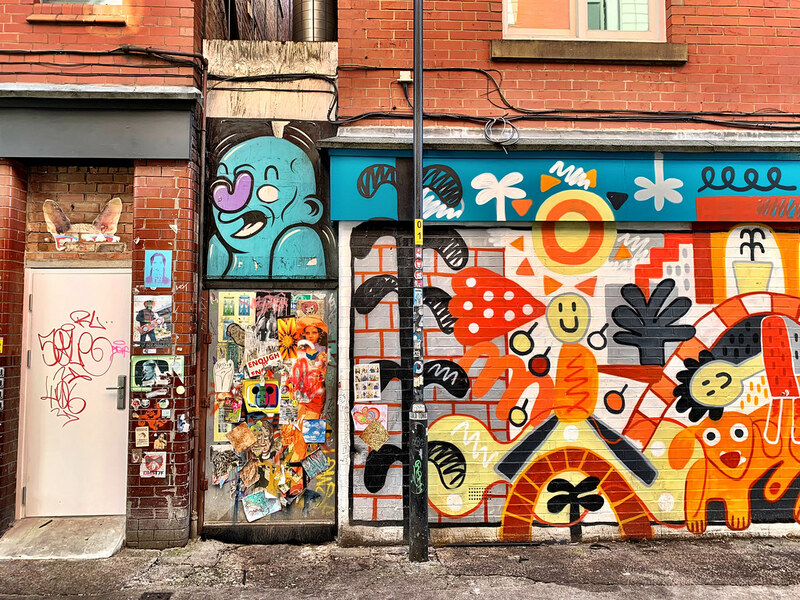 Manchester isn’t only a city of hard-working people though, it’s also a fiercely creative place, as was further proved on an afternoon walking tour of the hip and trendy Northern Quarter. Still a little rough around the edges, that’s actually what draws people to this neighborhood and is what made it ideal for the incredible street art on full display almost everywhere you look. Skyliner started out as a blog to document and preserve the creative side of Manchester, but has also evolved into tours sharing these treasures with others. Spending a couple of hours touring the Northern Quarter, I didn’t just enjoy the artwork, but I especially loved learning about the city and its more recent history through a very unique lens. I’ve been on many street art tours around the world, but this may just be one of the best. Manchester is not what I expected. Whether it was luxurious living at the King Street Townhouse Hotel, the incredible food scene or its art, I discovered a fun, dynamic city that is definitely on the rise. It’s also full of fun and expected moments, like an adult version of putt-putt at Junk Yard Golf or nightcaps at quiet, out of the way pubs. I freely admit that Manchester was not at the top of my list of places I wanted to visit in England, but now I realize what an oversight that was. Not only is it a destination I loved spending time in, it’s also a place I know I’ll return to just for the opportunity to delve even deeper into this onion of a city. Thanks for sharing it. I would love to explore each place. All the sites are fantastic.